This year’s theme for International Women’s Day, celebrated on March 8, is “Planet 50-50 by 2030: Step It Up for Gender Equality”. The day will be an opportunity for everyone, including local governments, to reflect on how to achieve SDG5 of the 2030 Agenda. Local governments’ commitment to SDG5, “achieve gender equality and empower all women and girls”, forms part of our long tradition of working internationally for gender equality. 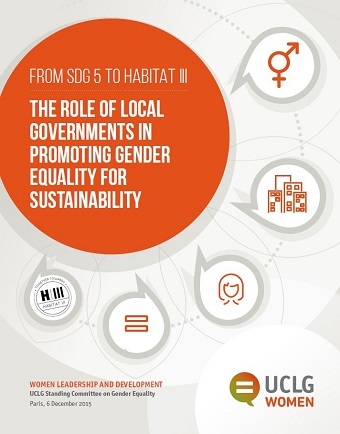 UCLG’s Standing Committee on Gender Equality, which brings together locally elected women from around the globe, recently published “From SDG5 to Habitat III: the role of local governments in promoting gender equality for sustainability” to highlight the role that gender equality at local level will play in the achievement of the major international development and sustainability agendas. SDG5 is directly related to many of the responsibilities of local governments. Local governments can have a significant impact on reducing discrimination and increasing opportunities for women by raising awareness and by mainstreaming a gender perspective across their policy-making, from urban planning to service provision and employment practices. 7. Mainstreaming a gender approach in the design and implementation of local and regional policies. Local governments are aware of our responsibility for achieving a 50-50 Planet and commit to work to increase the proportion of women in locally elected institutions. Currently, fewer than 5% of mayors and 20% of councilors worldwide are women, and local governments and their associations can play a decisive role in supporting women to stand for elected office (as shown, for example, by the Federation of Canadian Municipalities’ Diverse Voices for Change programme, or the Welcome Guide for Locally Elected Women of the Basque Association of Municipalities. We invite our members to use International Women’s Day as a platform to draw focus to the issues that affect women and girls around the world and push to change perceptions, practices and policies. For more information about Gender Equality click here.